Show an image of your product with clickable options selector overlaid on the image. Click on a product part or option to change it and see a real time visual example of the product you are building with the custom options you have selected. It’s not everyday consumers are given the opportunity to build what they are about to purchase completely from scratch. For shoppers looking to buy apparel online, more often than not the only options they are given to choose from are size, color, and length; however, there are numerous businesses that offer completely customizable build-your-own products for online purchasers. 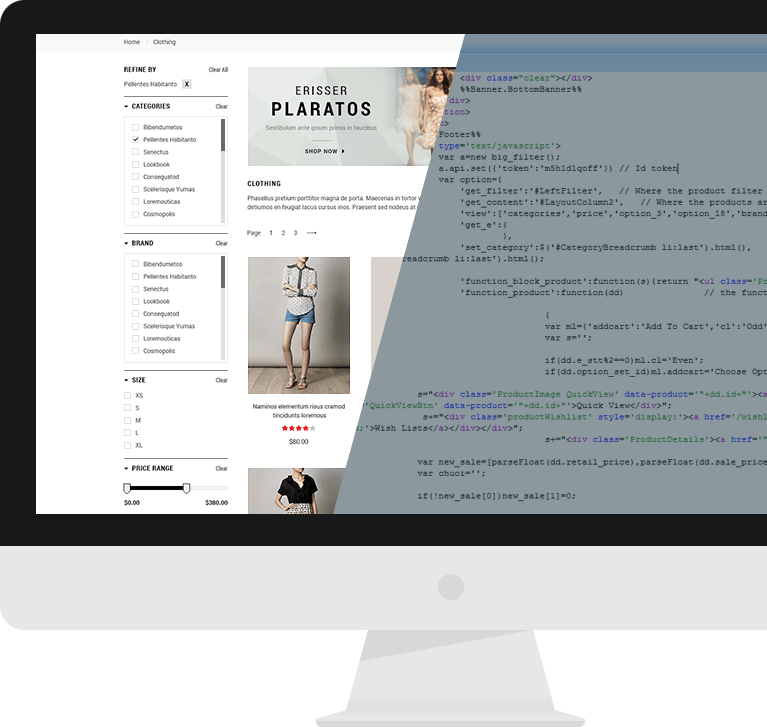 If you own a business that offers online consumers customizable build-your-own products, then this functionality is for you. This functionality makes it possible for customers to view a real time visual example of what the product they are building will look like if they order it. It allows customers to click through all of the available options for each customizable product. The functionality is great for online stores that sell clothing and any other customizable items. This functionality is extremely beneficial for businesses selling products that are available in a variety of styles and customization options. It allows customers to see what they are going to receive depending on the options they choose. If a store offers customers 1 shirt style with 20 different collar options to pick from, but it doesn’t provide a visual of what each collar looks like, then how could a customer possibly know which collar to choose? The Build-Your-Own Product functionality by Optimum7 makes the shopping process easier for customers who are perusing customizable products. This functionality offers online shoppers an interactive experience with eCommerce websites. Instead of reading paragraphs of product descriptions and clicking through slideshows of various images, customers can look at 1 image and change whatever customizable features are available for it. 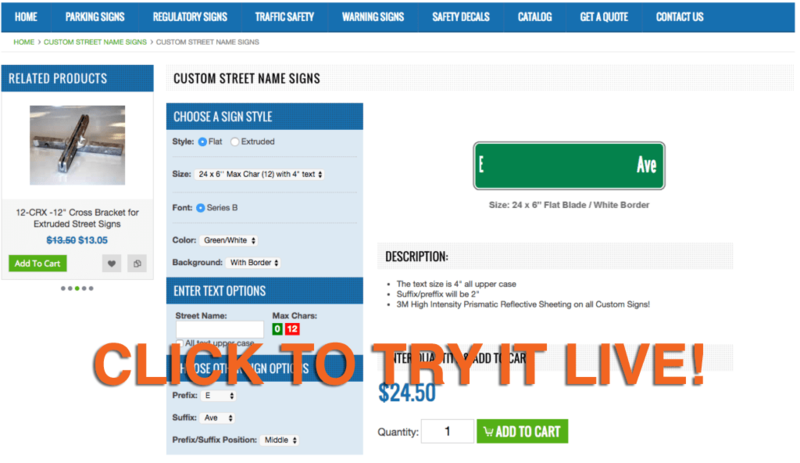 To see an example of this functionality in operation, check out the Build-Your-Own functionality on our client Dornbos Sign & Safety, Inc.’s website. 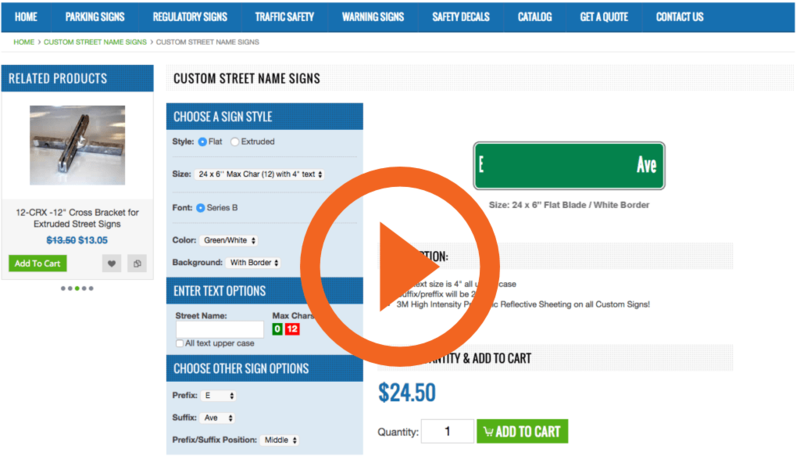 Dornbos Sign & Safety, Inc. offers customers Custom Street Name Signs and Optimum7’s Build-Your-Own Product functionality is extremely useful for their customers who are perusing how to build custom street name signs. To learn more about Optimum7’s Build-Your-Own Product functionality or to see how you can get it for your company’s website, reach out to Optimum7 today. Call us at 866-848-6072 and we’d be happy to help you.